Detox Diets: More Harm than Good? From restoring energy to removing toxins, most detox diets claim to have some sort of beneficial “cleansing” effect on the body. But are these liquid diets really that effective? Two years ago was the first (and last) time I encountered a detox diet experience. It was during my senior year of college, and my two friends decided to explore a detox diet for the first time. Little did they know, though, that three days of “juicing” would lead to fatigue, nausea, and hunger pains that eventually led to an early termination of the diet (and a deeper appreciation for real, wholesome food). With bags of fruits and vegetables in their hands, they were determined to make the most of their liquid diet. And they did. For three whole days, they made countless smoothies, alternating between a variety of fruit and vegetable blends. Strawberries, lettuce, bananas, mangos, kiwis, and watermelons…they all went straight into the blender. On days where they didn’t blend everything up, they simple ate them as whole fruits and vegetables. Amidst this juicing detox extravaganza, it didn’t really make sense to me how they could put themselves through three whole days of eating nothing but blended fruits and vegetables. Granted, I knew that fruits and vegetables could supply your body with plenty of nutrients, but is “detoxing” really the most nutritious way of removing harmful toxins from your body…and losing weight? Many dietitians say no. In fact, I did some research and discovered that while detox diets seek to cleanse the body from toxins and promote weight loss, most of them aren’t proven to do so. Cindy Moore, MS, RD, director of nutrition therapy at the Cleveland Clinic, recommends skipping liquid diets and gradually detoxing by adding one fruit and one vegetable a day to your diet to reach the recommended dietary allowance (you can check choosemyplate.gov for guidelines). This can help reduce the stomach pain that usually follows liquid diets and allow you to eat healthier over time. Kathleen M. Zelman, MPH, RD, LD, founding editor of popular nutrition blog Raise Healthy Eaters, says that detox diets are risky and can potentially deplete your body of vitamins and nutrients. She adds that these diets involve a rigid eating pattern and may leave you feeling nausea, tired, or lightheaded. Rather than drinking blended juices or eating only fruits and vegetables, she insists on a balanced diet that focuses on vegetables, fruits, whole grains, and lean protein—foods that are more likely to give you lasting results, especially if you exercise regularly. Other experts note that some detox diets can rely heavily on calorie restriction if followed for long periods of time (usually more than three days). These diets tend to be nutrient-poor and can lead to side effects like low energy, low blood sugar, fatigue, and nausea. In addition to an unhealthy eating pattern and potential side effects, detox diets aren’t actually required to “rid” your body of toxins. 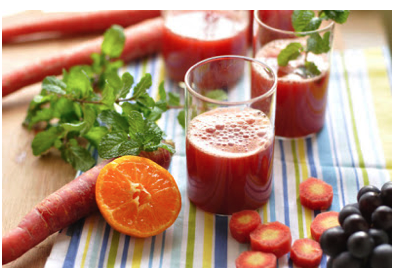 “There is no evidence that these detox diets do any kind of detoxification in the body,” says Andrea Giancoli, MPH, RD, and National Media Spokesperson for the Academy of Nutrition and Dietetics. “In reality, if you really want to detox your body the best thing to do is have a diet that has plenty of fiber, plenty of fruits and vegetables, a lot of whole grains, a lot of plant foods so that your immune system, your liver, kidneys, lungs and other organs in your body can naturally do their job to detox you on its own,” says Giancoli. In fact, our bodies have our own detoxification system (specifically, the liver, kidneys, and colon) that filters toxins to be excreted through the urine and stool. Plant-based foods with specific nutrients such as phytonutrients, flavonoids, vitamins, minerals, and certain amino acids can also enhance this process. Most dietitians can agree that following liquid diets for long periods of time is not a healthy way of eating and should be avoided altogether. Instead, they advise eating more fruits and vegetables like berries, grapes, carrots, beets, and cruciferous vegetables like broccoli, cauliflower, and Brussels sprouts to help boost natural detoxification. We all know a “detox” can be tempting, but don’t rely on this risky diet to help detoxify your body. Opt for a diet filled with fruits, vegetables, lean protein, and whole grains, which is a healthier way to lose weight and improve overall health. Mireille Najjar is a second-year NUTCOM student who prefers eating whole fruits and vegetables…and will not be trying any sort of detox diet anytime soon.